I had tried a few weeks ago to do a firmware update on the device using the metabase app after unboxing. However, after the update it turned to "Metaboot" mode and now it is not recognised by the metabase app (although it does appear as a bluetooth device). But after that firmware.zip file was "uploaded" by the nRF connect app, there was no effect on the device (still in metaboot mode). What's the hardware and firmware revision of your board? Thanks for the reply. And sorry about posting the log files. 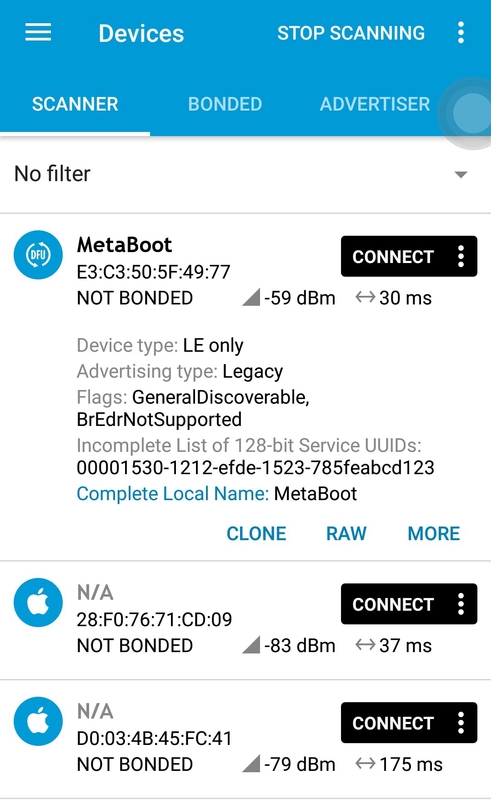 I would like to get the hardware and firmware information of the board, but the metawear doesn't show up on the metabase app on my android phone. Is there another way to obtain this information without using the metabase app? I might also try to use it and install metabase on another phone when I get home later tonight. If I'm successful, I will post the hardware and revision information on here. I would like to fix them, but I can't find an option anywhere on here to edit those posts. I'll attach the same log file to this post if that helps. I also tried installing the Metabase app on another android phone (Huawei Mate 10 Lite), but it was also not able to detect the MetaWear. 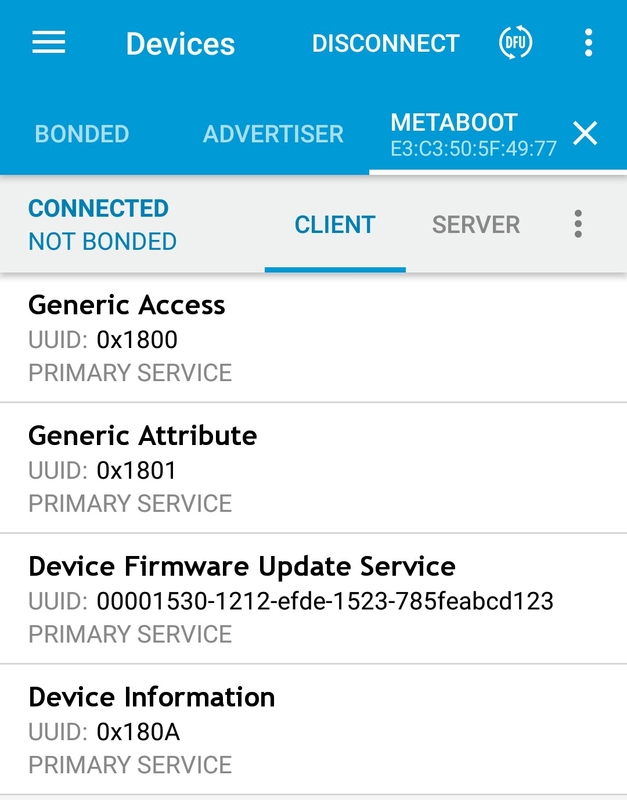 Thus, if the Metabase app doesn't detect the MetaWear (now "MetaBoot") - I don't know how to obtain hardware and firmware revision of the board? This link leads me to a "404" page could not be found. Did the link expire? Fixed the link in my post. Thanks. What should I do after uploading the firmware? Should I just wait or press the reset button? You don't need to do anything, just left nRF Connect do its thing. Downloaded the firmware.zip file from the link. Opened the nRF app, and connected to the "MetaBoot" device. Selected the MetaBoot device, and clicked the small "DFU" button in the top right corner of the nRF app. Then, selected to upload a .zip file package and selected the "firmware.zip" file. nRF App began uploading the firmware. Upload finished upon reaching 100%, but the device remained listed as "MetaBoot". 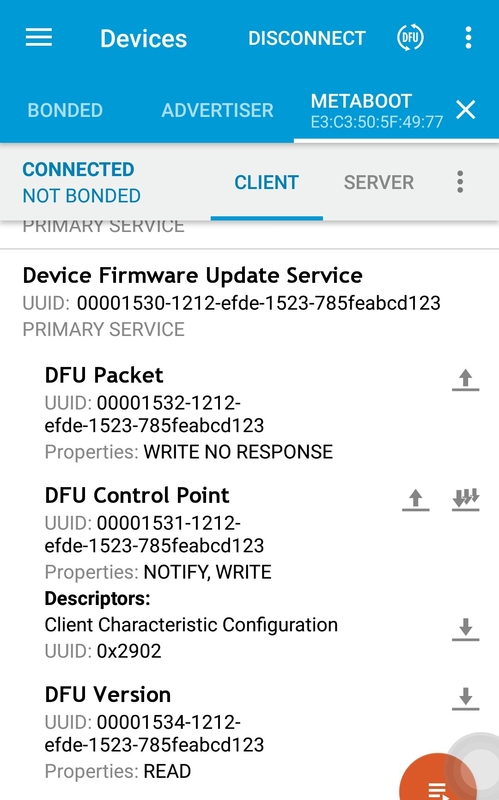 I disconnected the device from the nRF app. 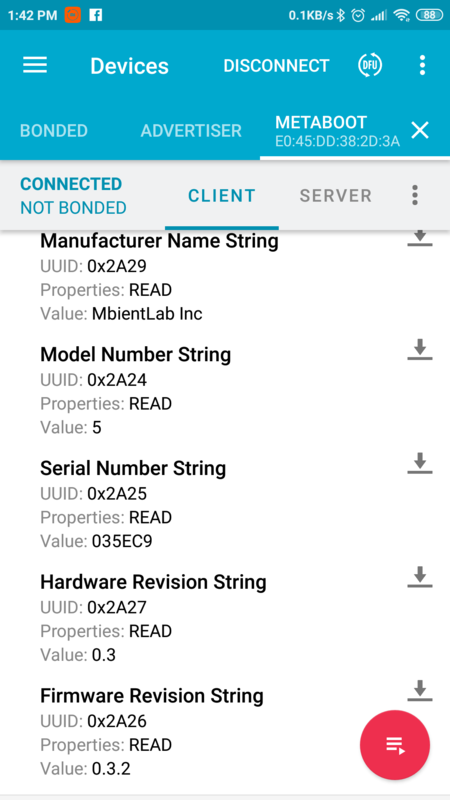 The nRF app still lists the Hardware Revision as 0.3, and the firmware revision as 0.3.2. The MetaBase app still can't see the device in the "Devices" list. I am also attaching the nRF log file for the steps that I've listed above. What Android phone and OS are you using? Can you try the same steps on an iOS device? 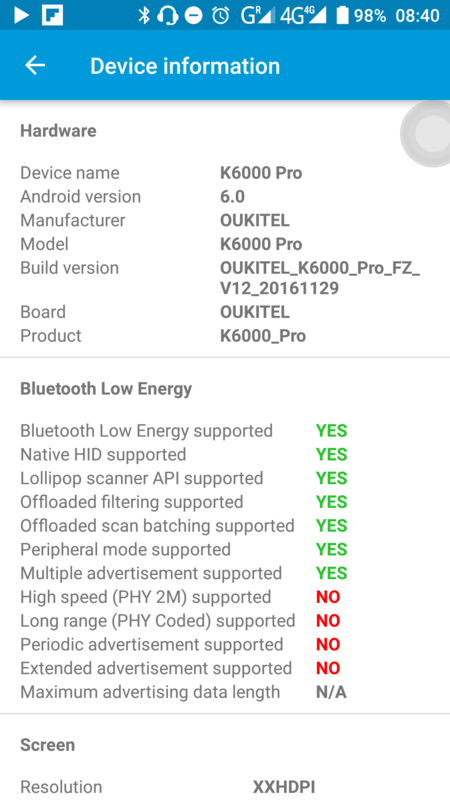 I am using an Oukitel K6000 pro under android version 6.0. Unfortunately, I can't reach anyone right now that had a iOS device. I am attaching an image of the phone details as detected by the nRF app. Any ideas on anything I can try, in case I can't find someone with an iOS device? We are playing around with some MetamotionR boards. We are having some problems with the board stuck in “Metaboot” mode. We checked that the hardware version is 0.3 and the firmware version is 0.3.2. We followed all your instructions in that thread. We tried it on different phones, iphones, android phones. 1. Downloaded the firmware.zip file from the link. 2. Opened the nRF app, and connected to the "MetaBoot" device. 3. Selected the MetaBoot device, and clicked the small "DFU" button in the top right corner of the nRF app. 4. Then, selected to upload a .zip file package and selected the "firmware.zip" file. 5. nRF App began uploading the firmware. 6. Upload finished upon reaching 100%, but the device remained listed as "MetaBoot". 7. I disconnected the device from the nRF app. Try refreshing the gatt services with the nRF connect app. Hi, I've recently encountered the same issue where my MetamotionR turns into Metaboot. Since this device was bought this year around February, should i upload the firmware.zip file from the link given above (https://mbientlab.com/releases/metawear/0.3/5/vanilla/1.4.2/firmware.zip) or is there a newer version that I should use? I have tried the troubleshoot part of soft reset and it did not work. So I plan to follow the nRF app to I think update or fix it. However, the link from above for the discussion board (https://mbientlab.com/community/discussion/2677/metamotionr-stuck-in-metaboot-mode#latest) seems to be deleted. Do help advise on what I should do, thanks. I've entered the post and tried to load my metaboot on my metabase app, but the metabase app is unable to detect my Metamotion R.
I did try to reinstall my metabase app, but still the same. Am currently using Redmi Note 4 phone. 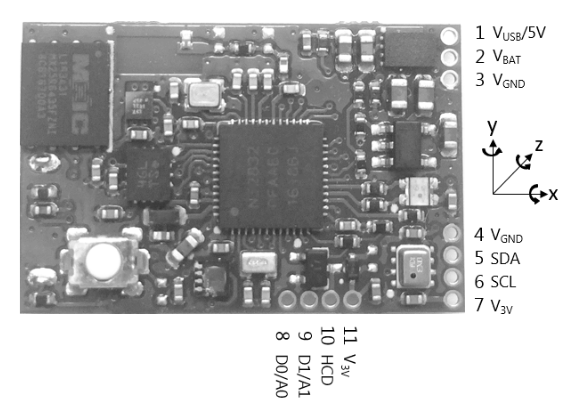 But below is a screenshot of the device information obtained from nRF. Please do a hard reset: www.mbientlab.com/troubleshooting. Then try to do a fresh metabase install on an iPhone 7 or newer and update firmware on your board (please ONLY use an IOS device that has not been used before - borrow from a friend or colleague if you have to). I've tried the hard reset according to the datasheet on pin 4 and 7 and also 11 and 4, But my LED didn't flash up at all. tried while it wasn't charging and while it was chargning. The LED might not flash and that's ok. Just short pin 4 and 7 real quick (for just 1ms or less). Once the reset is done, try to connect to the board with a fresh iPhone + metabase combo. This has worked for 100% of people that have had issues. I am also concerned your battery is dead and that could be why you don't see the LED flash. In that case, your board isn't in metaboot because it is stuck, it is in that mode because the battery is dead/over-depleted. In that case, you will need to replace the battery. But if the battery is dead, I wouldn't be able to like see it in metaboot right? I remembered it having about 50++% battery on the metabase app slightly before it became metaboot. If it doesn't work and am not able to fix it with an iPhone, do you mind telling me the next step? As where I'm staying, it's past midnight to when you all are online, and it would take another 24 hours to know what to do next.